Oregon Pinot Noir, Pinot Gris, Syrah and Chardonnay. 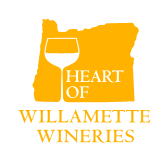 The Willamette Valley produces some of the highest quality Pinot gris. The most abundant white grape variety grown in Oregon, our Pinot gris delivers exactly what one desires; a taste of sunshine. Aromas of honey, apples and passion fruit swirl with flavors of grapefruit and fresh apricot. These fruit filled aromatics and citrus notes lead to a bright crisp, clean finish. This magic in a glass is the perfect wine to enjoy with friends or serve with your favorite seafood. The winery is open to visitors daily or by appointment. If you’d like to come out at other times, we’d love to have you. Please email or call to arrange a visit. Please join us the evening at the First Alternative Coop in south town from 4 to 7 for sampling our wine! They are having a special on our Pinot noir and our Pinot gris! Get ready for the beautiful weekend! Cheers! First Alternative Natural Foods Co-op Departments Once in a while, we receive recall notices from manufacturers. Click here to see recent recall information.